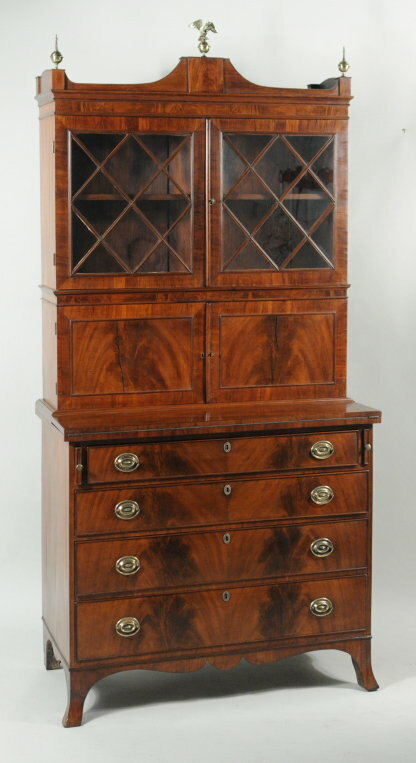 Very fine hepplewhite figured mahogany secretary desk, in two parts, the upper section with arcaded shaped cornice above two diamond mullioned glass doors, in turn above two flat paneled crotch mahogany veneered doors opening to a fitted interior with cubbies and drawers, the base with fold down writing board above four crotch veneered graduated drawers raised on flaring french feet with a shaped apron. Retains the original hardware and an old finish. Salem area, circa 1795-1800. 84 1/2" high, 41 1/2" wide, 21" deep.